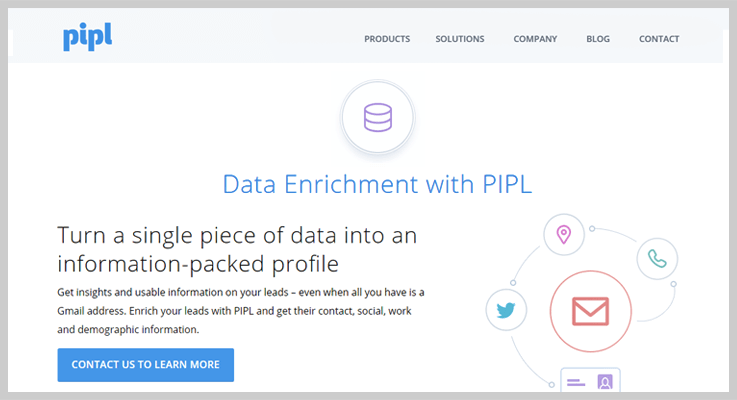 With help of lead enrichment tools, you can effortlessly find social media profiles by email address of your leads. Now, the question arises ‘How?’. Email enricher tools assist you to extract all the important details like current location, contact number, job profiles, career history or any kind of information just by the valid email ID of a person. Also, you can enrich the emails in bulk. Hence, you can fetch the complete information of thousands of people under one roof. Have you ever thought what a single email id could do? Here’s a brief description of all the email enrichment tools that will make the searching task a cakewalk. So, do have a look! Services Pricing Searches per month Search Methods Ratings! Now, let’s dive in and find out the best software for enriching the leads. FullContact is an efficient software application which permits you to search the details of social media profile of any person by entering his respective email id, Twitter handle account, contact number or company URL. And in return, it provides you with all the information regarding social networks. Apart from this, it also enriches you with a person’s location, bio, age, social affinities, current job profile, employment history etc. And this information will surely help you out to promote your services. Further, by using the FullContact API key, you will also be able to integrate this software on your other websites. Individual Plan: This plan is further divided into three pricing plans. This is a completely free plan. It provides you with various features such as you can organize contacts, syncs with one account (Google, iCloud, or Office 365 / Exchange), helps you to store 1k contacts safely on spreadsheets. If you want to avail this plan, you gotta pay $8.33/m & $99.99/y. With this, you can easily organize contacts up to 25k on different from different platforms, syncs with five different accounts (Google, iCloud, or Office 365 / Exchange), update your 500 contact list per week etc. They will charge you $9.99/m/user & $119.99/y. Plus, you to share the address book across your team members, 500 contact lookup per week with FullContact for Gmail, you will also get 14 days free trial service. Business Plan: This pricing is split into three categories. Trial Plan is fully free of cost. In this plan, you can try this plan for small projects, gets 100 matches/m, company data, view our docs sheets. Small Business Plan will cost you $499/m. And you will get complete 360° views of your users to deliver through APIs in real time, data add-ons can be done, data subscriptions, premium support etc. Enterprise Plan benefits you with professional services, integrate with millions of matches, a private plan, batch file processing and much more. To know the pricing of this plan contact sales team. Partner Plan: Its pricing is also distributed in two plans. Developer Plan will charge nothing but in return provides you the services such as found 100 person social platform details or company matches per month and see how FullContact unique identity data can enhance your products. 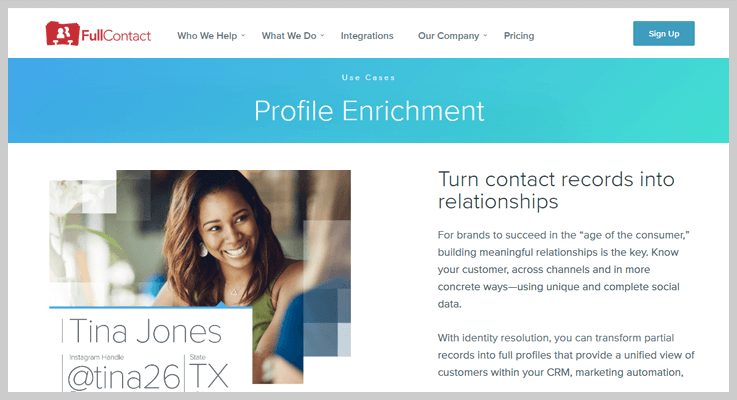 Custom Plan provides you with advanced services like you can add FullContact data to your own applications or solutions, API’s, custom rate limits, strict data privacy, and security controls. To get the pricing details contact to the sales team. It allows you to sync contacts across Google Contact (includes other contacts), iCloud, Exchange accounts, multiple Google accounts and then retrieve the information. FullContact software helps you to easily recognize the changes made in across connected accounts (For ex – if you create, edit, or erase a contact). In fact, this lead enrichment tool searches all over the public web once a month for updates of leads like the photo, job title, location etc., to your contacts. But for this update process, you have to upgrade to the premium plan. Clearbit lead enrichment software helps you out in gaining a complete information of your user prospects across there personal and professional lives. It enables you to search the person’s profile just by entering an email address & domain. And in return, it provides you with a person name, bio, employment, role, seniority, site, Twitter profile, LinkedIn profile etc. Clear bit offers four primary and eleven additional type of integration. Moreover, it collects data from 250 public and private platforms and it always presents the data in real-time which is always fresh and relevant. If you want to enrich 1000 leads, you will have to pay $199.0/m. While for collecting data of 25000 leads pay $499.0/m. Note: If you are managing marketing automation software like Salesforce and Marketo then you have to pay $499/month. Clearbit enriches you to gather more data over 85 unique data points. This includes personal (name, email, location, time zone, bio, avatar, site etc) & company (legal company name, domain aliases, UTC offset, raised fund etc) details. This tool automatically keeps on updating the data in an interval of every 30 days with Salesforce integration. 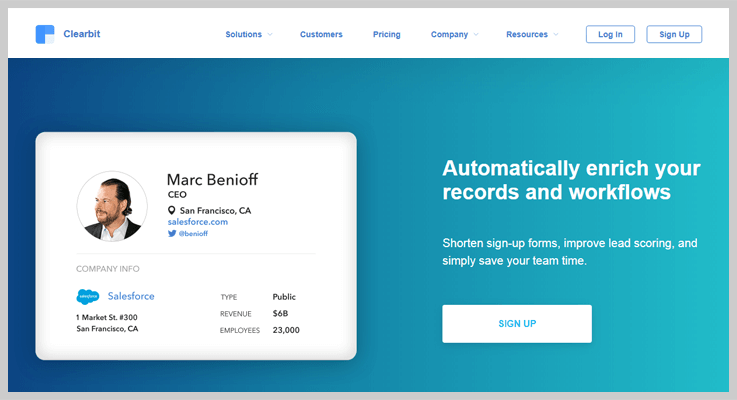 It allows you to add the Clearbit fetch data with the Salesforce usability. That helps you incorrectly segmenting the leads, instant turn the disconnected data into actionable data. Use Behind & find social media profiles on the different platform just by entering person email id. Its a USA(California) based lead enrichment software. This software will display all the information about the person in a dialogue box with his respect name, location, job info, and other accounts related to his profile. In fact, you can collect the details of around 2,000,000,000 emails profile available at a time. Behind consists of two pricing plan. First Plan: To fetch the detail like job profile, current location, age etc of single email id you have to pay $1.99. Second Plan: With this plan, you can create an unlimited number of reports for that you have to subscribe for its unlimited membership which costs $4.99/m. This software allows you to recognize the location of the particular person with the help of Google Map integration. All you need to do is enter the email id. You can catch both the personal as well as professional details on 50+ social networks. Further, all the fetch data of persons will be delivered you back in.CSV format and spreadsheet. Also, it provides you with a feature of email confirmation. 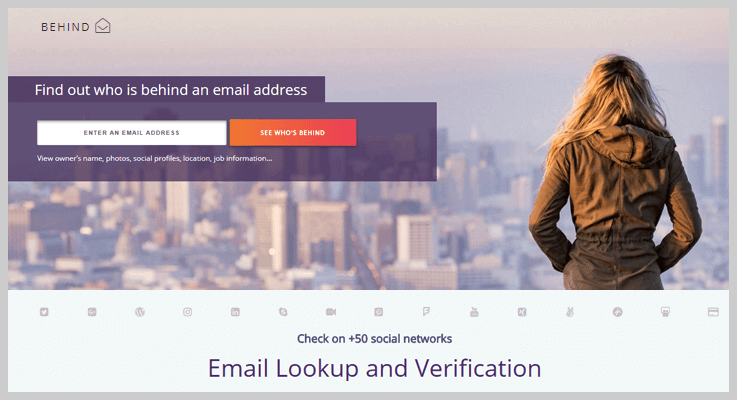 That means you can simply verify an email address and which person owns that address. This is a search engine which facilitates you with various details of a person. These details can be social profiles, images, career details, demographics and much more. Pipl only allows you to enter a valid email address in the search bar. Most of the big companies in the world depend on Pipl search engine as it can find up to 20 billion records. Plan1: It costs you $0.50/match where you can collect the details like age, gender, landline phone number etc. Plan2: This plan comes with a price tag of $0.10/match. And it fetches details like contact, social network, and associates. Plan3: You have to pay $0.40/match. And it collects all the information such as job, education, mobile, and email. It allows you to collect accurate information by entering person email address. And information collected from all the social networks will be displayed. This software provides you with an API key. With the help of this, you can integrate this lead enrichment tool on your website. You can also target the specific audience and personalize the data you are basically searching for. MailGet Enricher is a web-based tool that helps you to collect the information about your leads from different social networks. Upload the email list & get information about social networks, phone number, name, address, age, etc in the form of a CSV file. Moreover, MailGet Enricher is used and trusted by 1,200+ companies like AVAYA, ISKCON, CISCO etc. Starter Plan: This is the lowest price plan with cost $4 in which you will be able to catch out the details of 200 emails. Rookie Plan: To fetch the details like name, age, location etc of 1000 emails at a time you have to pay $19. Pro Plan: For availing this plan, you gotta pay $99 to enrich 5000 emails. Advance Plan: This is the highest pricing plan of MailGet Enricher for $175 with 10,000 emails. That helps you to extract facts of social media about a person. This software provides you with all the personal and professional background report of a person in a few clicks. With this, you can collect personal & professional information about the person like status, myspace, photo, social profiles etc. 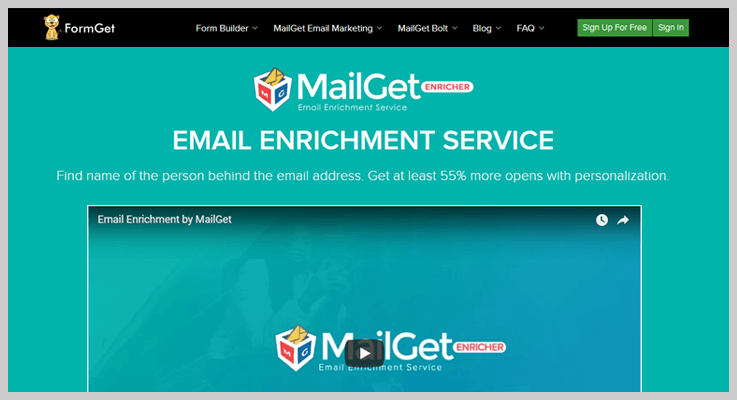 Also, MailGet Enricher lead enrichment tool benefits you to enrich the data in bulk. You only have to upload the .CSV format or Excel Spreadsheet & get details of the same. Above we have mentioned the best lead enrichment software to find social media profiles by email address. All the tools presented above are jampacked with the best of functionalities. Such as instant data, search on all social platforms etc. and are very cheap in cost. We hope that you might have got the best email enricher tool for our website. If you have any query or suggestion please comment below!